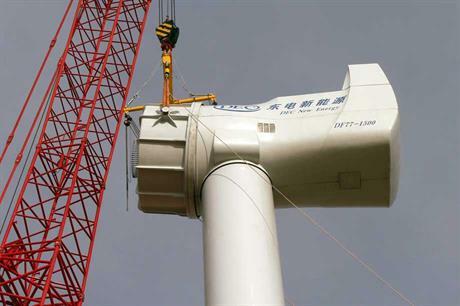 CHINA: Chinese manufacturer Dongfang Electric has exported three 1.5MW direct-drive wind turbines to Finland. Chinese wind turbine maker Dongfang Electric has exported three 1.5MW direct-drive permanent magnetic wind turbines to Finland. It did not name the Finnish buyer. Dongfang Electric said it shipped the three turbines, worth EUR 3.84 million, to Finland on 16 March. The three turbines were produced at Dongfang's plant in Hangzhou, Zhejiang province, eastern China. The Chinese company said it wanted to use its experience from the deal as a springboard into international markets. It did not dislose the purchaser of the Finnish turbines. The 1.5MW direct-drive turbine with permanent magnet generator was developed jointly by Dongfang, GL Garrad Hassan and Finnish drivetrain supplier The Switch. The turbines comprise the three types of DF70-1500, DF77-1500 and DF82-1500. It is also able to produce 2.5MW and 3MW direct-drive and permanent magnetic turbines. It is also working on a 5.5MW turbine, developed with AMSC. Dongfang Electric was the ninth largest in new installations in China, totalling 466.5MW, in 2012. It occupied 3.6% of the Chinese market. In terms of overall installation in the Chinese market, it was the third largest by the end of 2012, with 7,364.5MW, 9.8% of Chinese market share.